to the untrained eye, this is simply a bad photo. perhaps a bit yucky, even. but this represents what i hope is a growing movement toward making london feel even more like home. this, people, is a made-to-order grilled chicken burrito with black beans, cheese, lettuce, rice and salsa. in islington. two guys who met when they were working at skype decided to open mucho mas, a mexican restaurant in angel, my old stomping grounds. although i was doubtful at first, i welcome the efforts of anyone who knows that salsa is not ketchup. my happy verdict? nearly on a par on with cactus and gordo back home - i give it extra marks for liberal use of lime and real, fresh, spicy, salsa! imagine! - but they need to work on the portion size. it was one bite too small. why does it make me so happy that there is mexican food in london that is not wrapped in the unholy yellowness of an old el paso box? isn't it obvious? 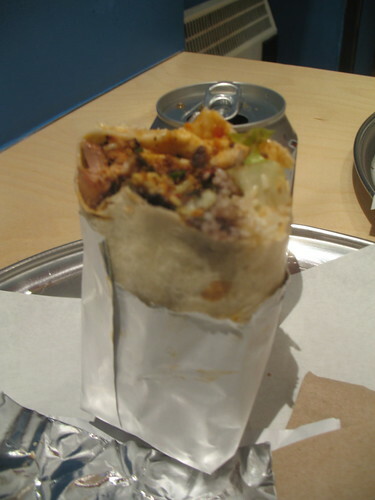 i am still thinking about this burrito days later. that must be a good sign. i hope mucho mas catches on, and the guys choose clapham common or wimbledon for their next shop. oh - and a special request: spinach tortillas, por favor! Wow, what a concept----good Mexican food in London! Hey Branwyn, I'm back in town----but am heading out for a job in Singapore. I ship out March 1st! Happy knitting! I didn't enjoy Mucho Mas, but maybe I hit them on an off day. loved your valentine's card, by the way!